The author at Glen Onoko Falls, Northeastern PA.
Katie Levy is a Philadelphia-based outdoor addict with a passion for playing outside and sharing that passion with others. She grew up in beautiful Ithaca, New York, a town with gorges and waterfalls aplenty, all playing a part in kindling a wonderful relationship with the outdoors at a young age. She'd pretend to be a professional bike racer and “live off the land” by making fires she never lit and “meals” of berries in old Fancy Feast cat food cans. 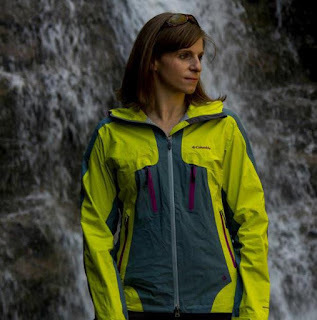 After 13 years as a competitive swimmer, she followed her outdoor passions on backpacking trips in the Adirondacks, Virginia, and Ontario, and sub-zero winter hikes in the Chugach Mountains and through trail-less Denali tundra during a too-short stint in Alaska. Visits to places like the Adirondacks, Joshua Tree, Bryce Canyon, Mount Rainier, Denali and some of the beautiful places in her own Pennsylvania backyard solidified her passion for testing her limits outdoors. Now, through Adventure-Inspired, Katie hope to share her passion for playing outside with anyone willing to listen, and anyone who enjoys telling stories around a campfire as much as she does. Outside of her writing here, she's a sales effectiveness professional, a hiker, a backpacker, a skier, an occasional climber and mountain biker, and a fervently competitive Crossfit athlete. "We can be inspired by, and learn and grow from adventures of all shapes and sizes, and by sharing them with each other." What's now Adventure-Inspired initially began as the author's personal blog, a way for her to share her adventures with her family and friends. But after realizing there was a possibility others might benefit from what she had to share, Adventure-Inspired evolved into an outdoor lifestyle website complete with instructional articles, interviews, gear reviews and trip reports, among other things. From rock climbing to hiking, from mountaineering to mountain biking and everything in between, Adventure-Inspired exists as a place to tell stories and share musings, gear reviews, and anything else related to playing outside. Katie hopes you're able to find inspiration in the stories, relate to the musings, and find awesome new gear you can't live without!